Democratic presidential candidate Hillary Clinton fell ill as she became overheated and had to leave early from a September 11 memorial ceremony in New York City. 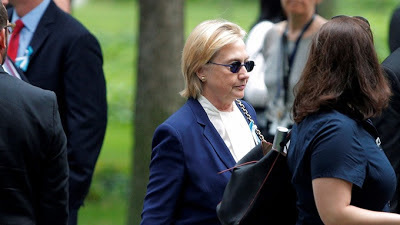 Clinton, 68, was taken to her daughter Chelsea's home in Manhattan, and emerged later wearing sunglasses and telling reporters that she was feeling great, around two hours after she left the event on a hot and muggy morning. Video posted to social media showed Clinton as she left the ceremony, standing rigidly but upright while an aide holds her arm. As a motorcade vehicle approached, Clinton wearing the same clothing as at the televised memorial, swayed and her knees buckled. She was helped into the van.